Explore the stories of buildings on audio tours brought to you by the leading architecture and cultural organizations. Celebrate the work of the architects you know, and discover lesser-known gems from the past and present, designed in a variety of styles. 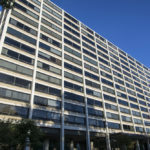 Experience this residential building in the International Style, designed by the father of modernist architecture. Highfield House is listed on the National Register of Historic Places. Learn more on the audio tour for Doors Open Baltimore, organized by Baltimore Architecture Foundation. 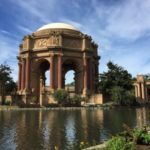 The renowned architect designed the building for the Panama Pacific International Exposition of 1915. It was not built to be permanent. But after the exposition the citizens of San Francisco felt it was too beautiful to tear down. The Palace was restored with public and private funds to serve as a performance space. Learn more on audio tour by AIA San Francisco. 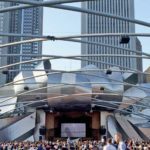 Gehry designed this outdoor performance venue in Millenium Park, in his signature style with stainless-steel ribbons framing the stage. The state-of-the-art sound system is the first of its kind in the world, designed to mimic the acoustics of an indoor concert hall outdoors. The audio tour is presented by Past Preservers. 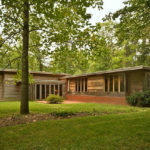 Meet the American master of 20th century architecture through this modest home, referred to as Usonian, thought to mean “the United States of North America”. This is a site of the National Trust for Historic Preservation. Learn more on audio tour by Visit Alexandria. The master architect designed some of the best known structures in the US, such as the Washington Square Arch in New York City. 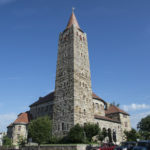 This Romanesque style church is now listed on the National Register of Historic Places. Learn more on the audio tour for Doors Open Baltimore, organized by Baltimore Architecture Foundation. 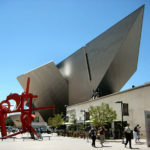 The architect was inspired by the jutting cliffs of the Rocky Mountains for the extension to the Denver Art Museum. The building creates an “out of the box” experience for visitors. Learn more in audio walking tour by AARP Colorado Chapter. 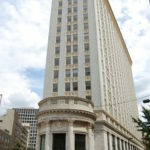 Designed in the style of the Chicago School, the Hurt Building is one of Atlanta’s earliest skyscrapers. This flatiron building features both Beaux Arts classicism and the emerging modernist aesthetic. Learn more in audio tour by AIA Atlanta.